The truth is that I have not been to a happy hour in years. I look forward to the happy hour *food* specials rather than the alcoholic drinks. 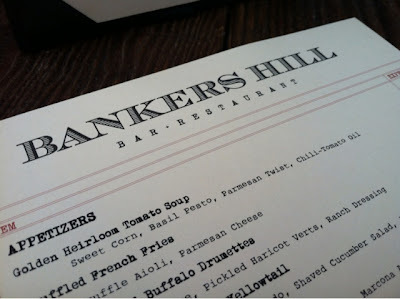 A group of girlfriends and I visited Bankers Hill Bar and Restaurant after work one early evening. One of my friends, CK, works at Bankers Hill occasionally on the weekends and in the evenings and she invited us to visit her workplace. 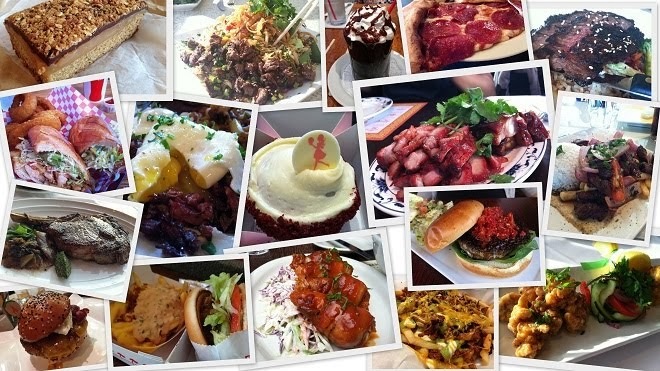 I have heard so much about this restaurant from her, especially their amazing truffle fries and their amazing dishes. 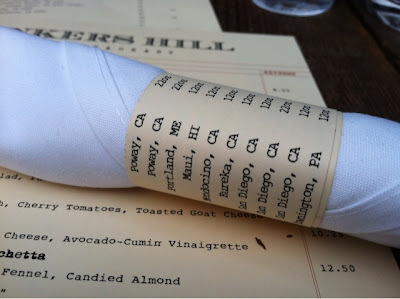 Bankers Hill prints out a new menu every week and they use the older menus as napkin rings. LOVE it. Very sustainable! 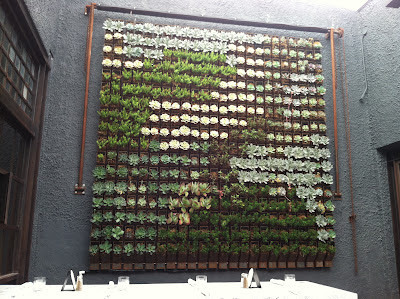 We sat on the outside patio, which is located at the front of the restaurant. I had to take a picture of their 'plant wall'. It was absolutely amazing to look at. The happy hour menu consists of many eclectic appetizers to share. CK took the liberty to order for all four of us. We started off with the Deviled Farmers Market Eggs. 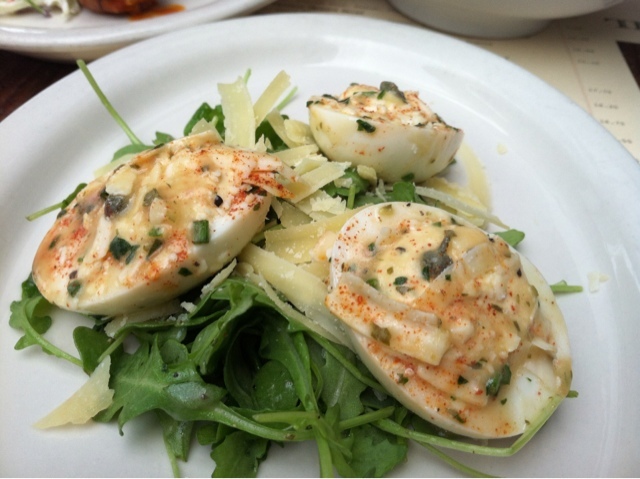 Three eggs come in a serving laying on a bed of crispy arugula and shaved parmesan. The filling of the egg was quite flavorful and had capers in them. The Bacon Wrapped Buffalo Drummettes were my absolute favorite appetizer. They were spicy, salty, moist and delicious. They were served on top of my favorite salad... crunchy coleslaw. 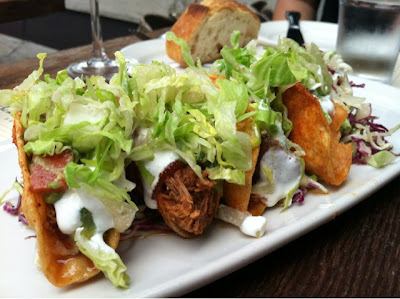 The Crispy BBQ Braised Pork Tacos were really cute and fit into the palm of my small hand. If my husband were holding them, two or three of them would fit in his hand. The taco shells were freshly fried and had a little chili seasoning dusted on each one. 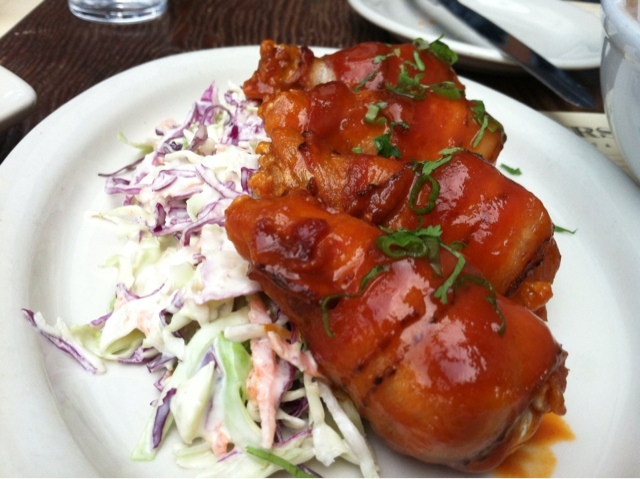 The braised pork melted in my mouth. Oooh, I enjoyed the cool sour cream that was doused over each taco... I love sour cream. 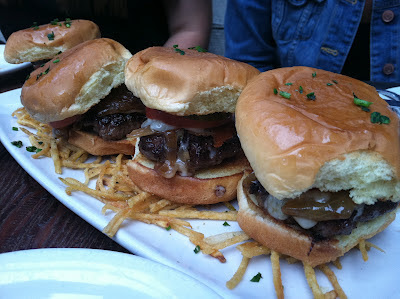 The mini BH burgers were pretty darn cute. 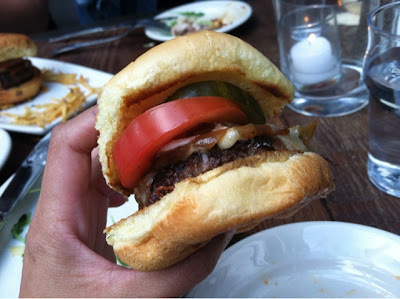 Aged white cheddar, caramelized onions, sweet tomato slice, and a crunchy pickle slice all settled in between a soft burger bun. 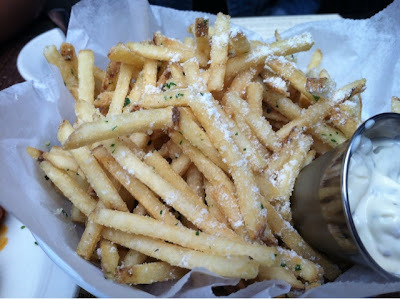 The truffle fries were deliciously crisp and had a sprinkle of parmesan on them. They were served with truffle aioli. Eaten together, they were super addicting and we could not stop eating them. 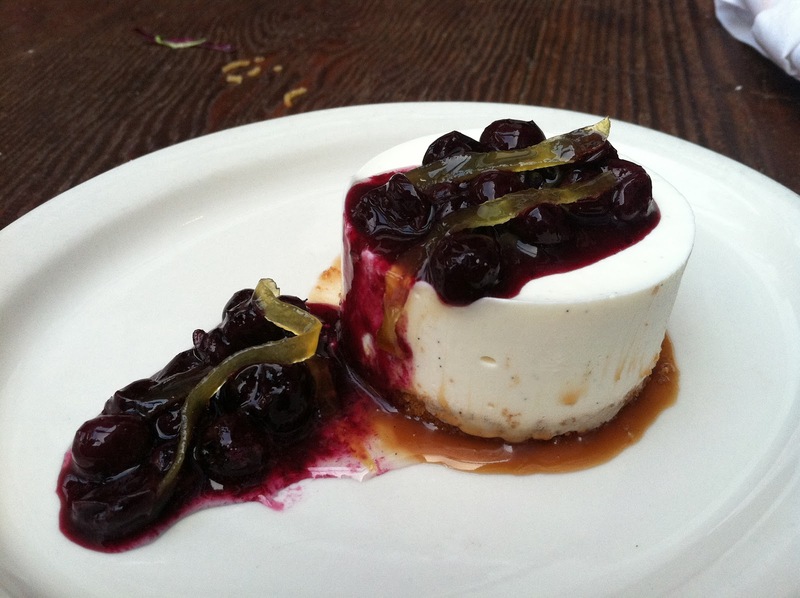 To satisfy our need for something sweet after a variety of savory happy hour dishes, we ordered the blueberry cheesecake. Oh my, a bite of the cheesecake took me back to my childhood when I used to enjoy the BEST blueberry flavored frozen yogurt by my parent's home. Bankers Hill is a place that will definitely thrive in San Diego for their flavor, environment and committment to delicious food. My girlfriends and I highly recommend! What is a "butterburger"? Burgers cooked in clarified butter? Butter in the center of the hamburger patty? So many guesses went through my mind before I found out that it is a simple brush of melted butter on the toasted hamburger bun. 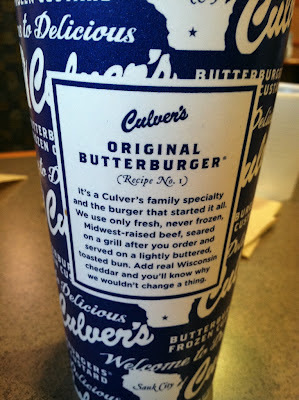 Culver's motto is "Welcome to Delicious" and I know why. 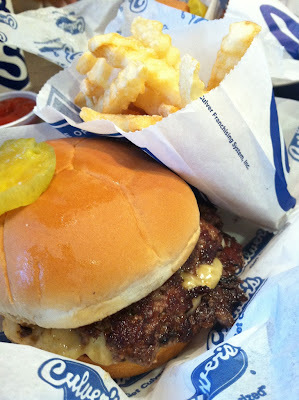 The butterburger and frozen custard that I ordered in Phoenix were just that; delicious. 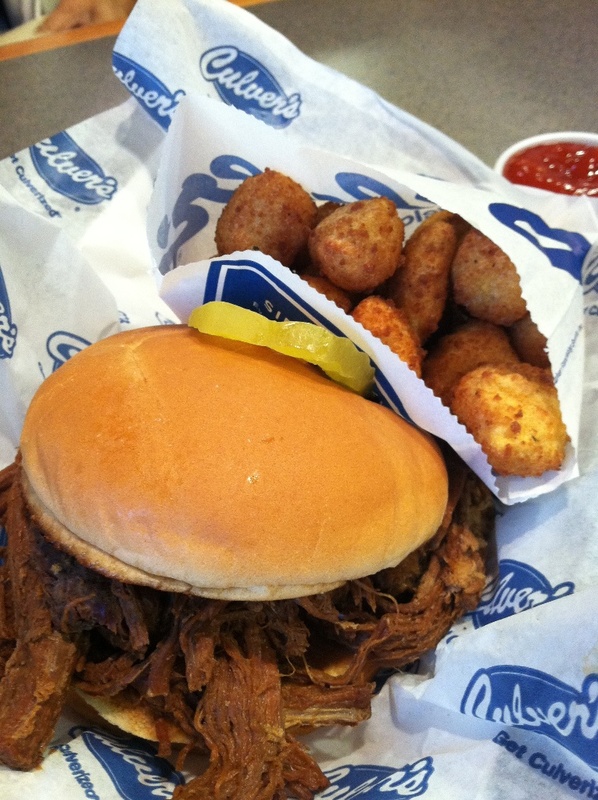 The first Culver's opened in Wisconsin. They only serve beef from the Midwest and use dairy products from their home state of Wisconsin at their restaurants. Pretty cool, huh? My butterburger food adventure occurred in Phoenix, Arizona where we have family. 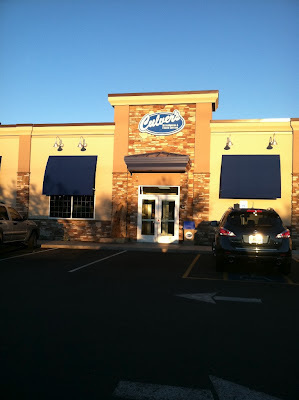 We arrived one warm evening ready to indulge in our first Culver's experience. The restaurant layout is the standard fast food chain restaurant... booths, tables, a counter where you place your order, and self-serve soft drink station. 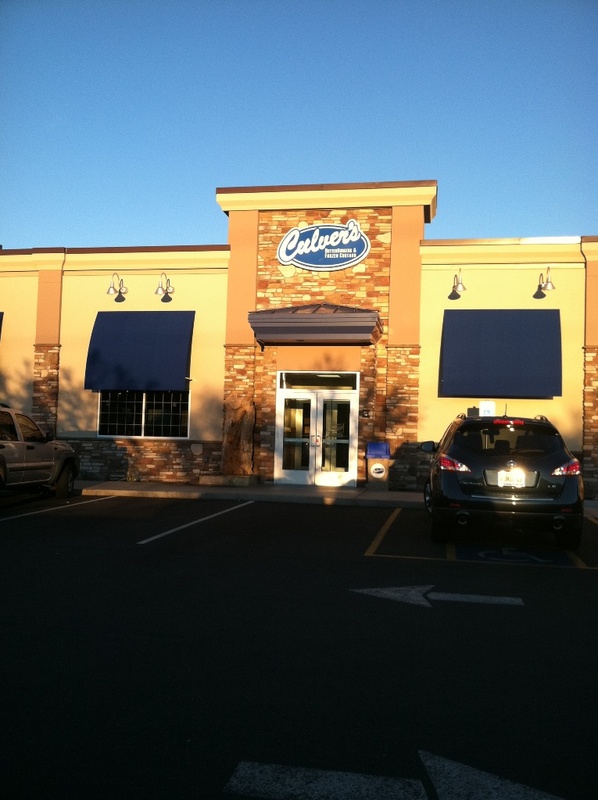 Culver's serves a wide range of comfort fast food, like burgers, fried chicken, fish n' chips, and salads. They even have their own root beer. My hubby and I ordered the "special" butterburger that is not on their regular menu - the French Onion Butterburger with a side of crinkle cut fries. When we found out that every burger comes with two patties, we thought that we would be overindulging, but the patties are super thin and both had a crispy exterior. The French Onion Butterburger was super rich and absolutely delicious. 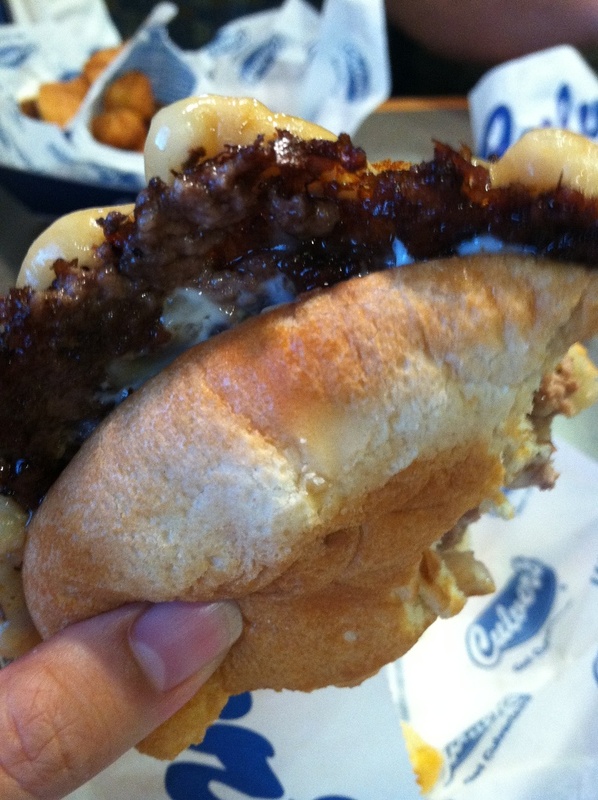 The ingredients were simple... burger patties, grilled red onions, melted Swiss cheese, and a smidge of mayo. The bun was soft and fresh. Each sandwich/burger is topped off with a slice of a dill pickle. The cheese curds were something that I have not tried before. The Culver's employee told us that they are similar to fried mozzarella cheese. Yeah, they pretty much tasted like that. 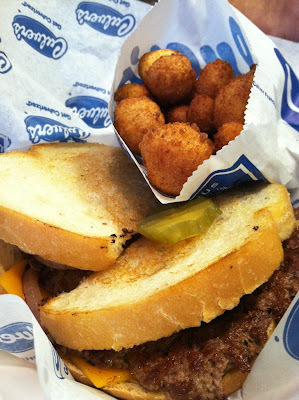 There is nothing else exciting to report about the cheese curds, but I can now say that I actually ate one. 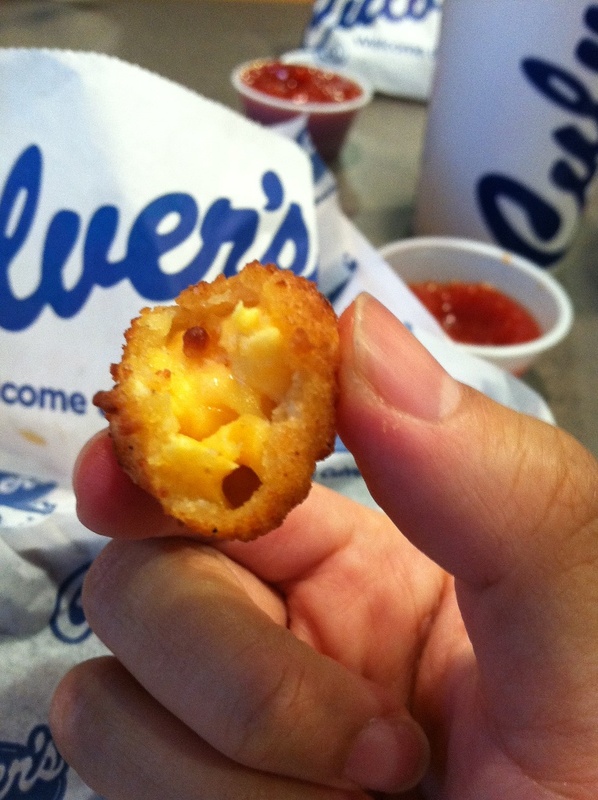 Sorry, cheese curds. FROZEN CUSTARD. Yum. Frozen custard is like ice cream, but has a different and smoother consistency due a higher concentration of milkfat and egg yolks. Every bite was creamy.... and yummy. 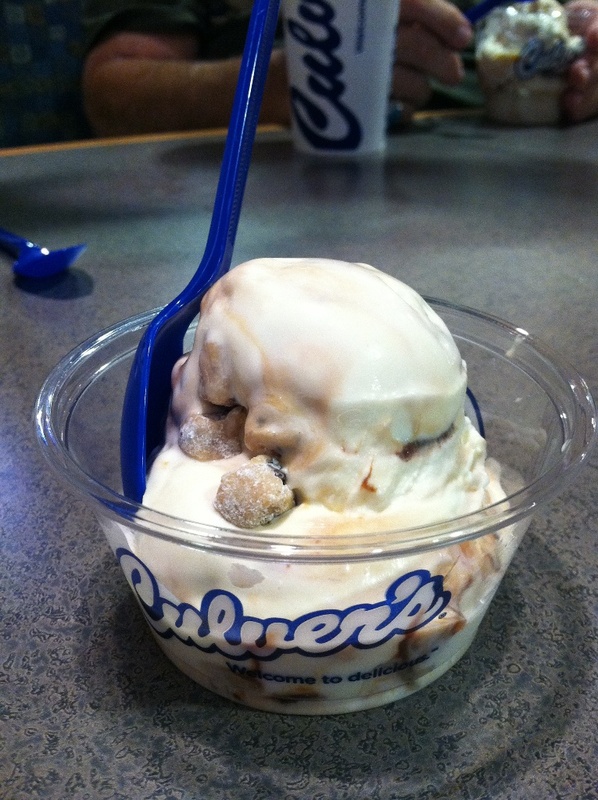 The "flavor of the day" during our trip was Caramel Fudge Cookie Dough. What? 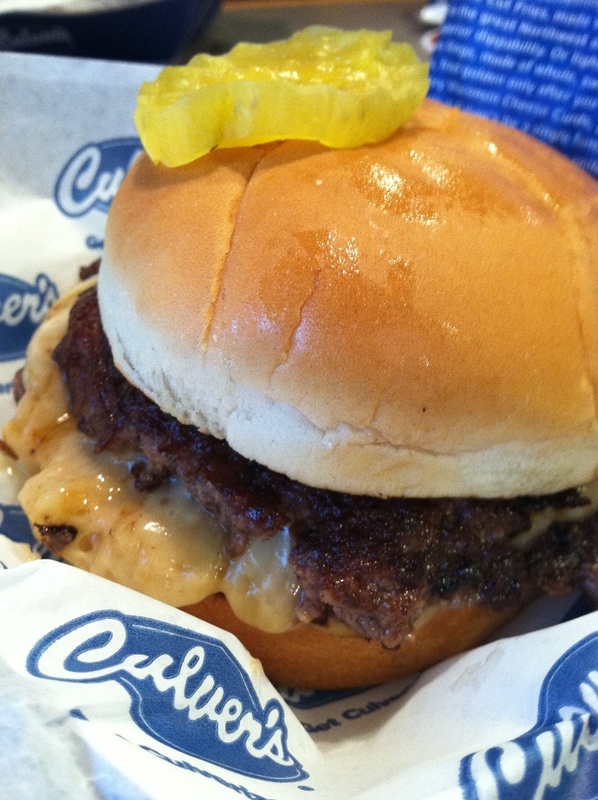 Yes, it was definitely a must HAVE at Culver's. If you want to satisfy your sweet tooth and there is a Culver's in your area, I suggest trying their "flavor of the day" or even treating yourself to a root beer float (with their own brewed root beer). My burger was delicious, but because it is not a part of their regular menu, I will probably skip having an entree here and mainly just go for dessert. A delicious, well marbled, seared rib eye steak would be my last meal if the world was ending. It is absolutely my favorite cut of beef because of its succulence and flavor. I would prefer a rib eye than any sweet treat any day! 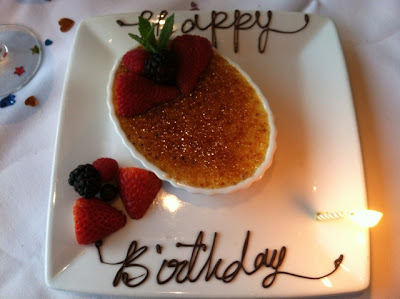 When the hubby surprised me for my 'thirty something-th' birthday and drove towards the valet parking kiosk at Ruth's Chris Steak House, I was beyond ecstatic. We couldn't even remember the last time we ate at Ruth's Chris because it has been a long time. I was looking forward to a delicious evening with my husband and with my rib eye. Ruth's Chris Steak House is a chain restaurant founded in New Orleans, Louisiana and has restaurants all over the country. They make a darn good [U.S. Prime] steak, I tell you, and it is worth every darn penny. Now, meat-eaters, who doesn't love a sizzling, buttery seared steak brought to you on a hot 500 degree plate? We were seated at a table near the window that overlooked the bay. 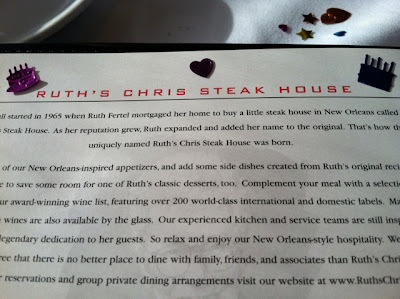 The staff at Ruth's Chris sprinkled birthday confetti on the white linen lined table for me [see top photo]. It was really sweet of them! 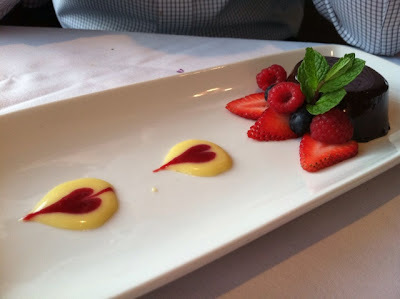 We were delightfully surprised to see that Ruth's Chris offers a prix fixe dinner for $40 a person. 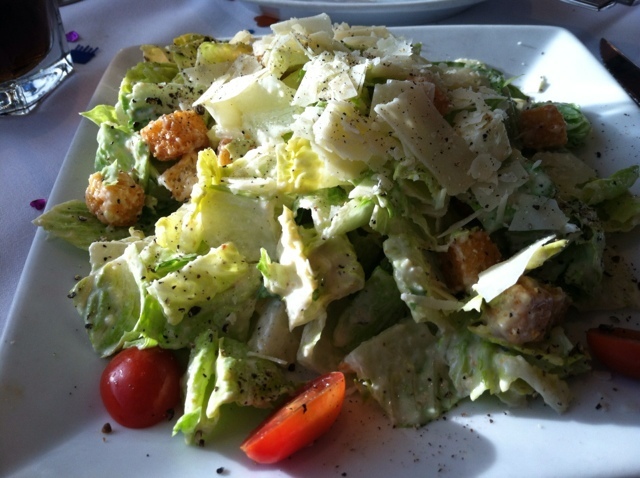 The meal includes a salad, an entree, a personal side dish, and a dessert to share. The entrees included various cuts of beef, chicken and fish. 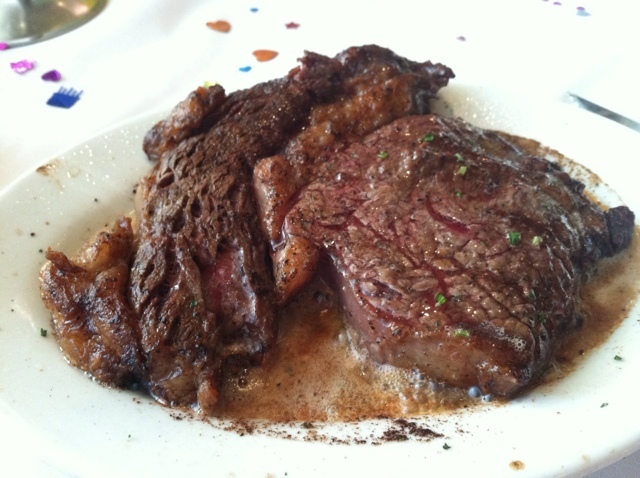 We thought that we received a smaller cut/entree portion since the average price for a steak a la carte is about $40. We were absolutely wrong. Guests are served the full sized entree. Wow, what a deal! 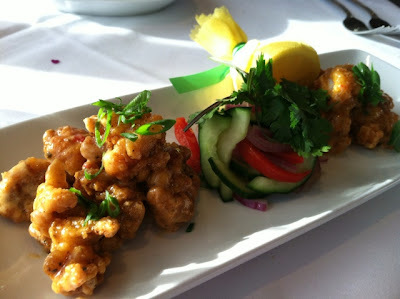 We ordered the spicy lobster as an appetizer [separate from the prix fixe meal]. The lobster bites were lightly fried and coated in a spicy sauce. The lobster was not covered in batter, thank goodness. Instead the lobster appeared to be lightly dredged and fried - every bite was perfect. It was also served with a cold cucumber, red pepper and red onion salad that was cool and refreshing. It paired with the spicy lobster very well. We both ordered a Caesar salad and a rib eye steak. 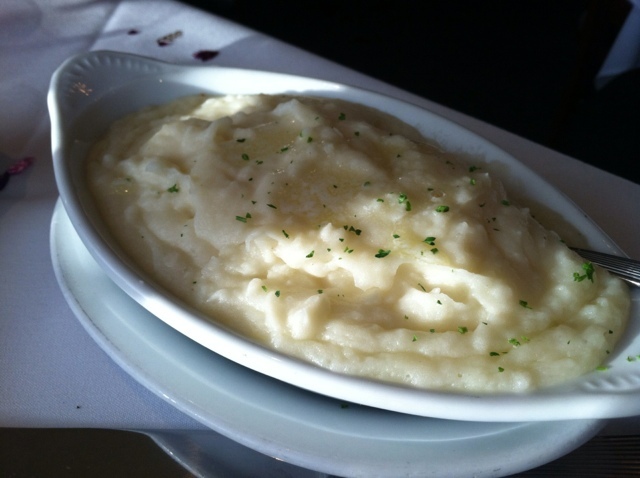 With the prix fixe dinner, we are served a personal side dish, as opposed to their larger sharable sides. 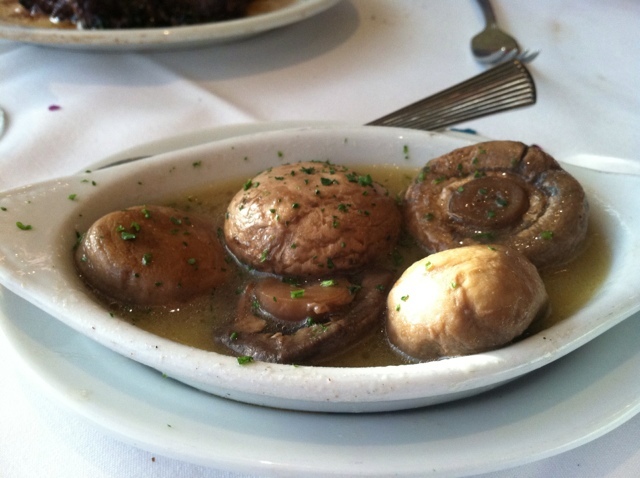 We ordered the sauteed mushrooms as one of the smaller side dishes and upgraded to the regular portion of garlic mashed potatoes. For my birthday, I had the opportunity to select any dessert on their regular menu. *smirk* It was a must to order their creme brulee. It was delivered to me with a candle on the plate and wrote "Happy Birthday" in chocolate. It was so silky and sinful. I loved the vanilla bean aroma. I loved the crunch, not only from the bruleed sugar, but from the blueberries, raspberries, and strawberries against the smooth creme. Heaven! We also were served our prix fixe dinner dessert, a mini chocolate sin cake.